"Although my grandma was Danish, she was famous for her slow-cooked Italian tomato sauce. It cooks a long time, but is well worth the wait." Heat a large skillet over medium-high heat and stir in Italian sausage, ground beef, onion, and garlic. Cook and stir until the meat is crumbly, evenly browned, and no longer pink, about 15 minutes. Use a potato masher to mash and blend the meat mixture every few minutes. Drain and discard any excess grease. Stir in diced tomatoes, tomato paste, tomato sauce, chicken broth, red wine, Italian seasoning, basil, salt, and black pepper. Transfer the sauce to a slow cooker and cook on low for 6 to 8 hours. I recommend using fire-roasted canned tomatoes. If you don't have fresh basil, you can substitute 2 tablespoons dried. Wow! So delicious! I omitted the ground beef because I didn't need that much sauce. I also added a heaping 1/2 tsp of cayenne pepper because my family loves spicy food. So good! 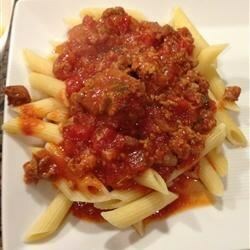 I have been looking for a good tomato sauce recipe and I found it. This is excellent exactly as written!